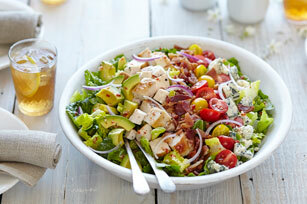 Serve this Zesty Cobb Salad on a large, flat platter for a spectacular presentation. Top with rows of all remaining ingredients except dressing. Prepare using a rotisserie chicken purchased from the grocery store. Look for avocados that are either slightly soft or firm. Small light-brown markings on the peels are normal and won't affect the quality of the fruit inside. If mashing the avocados for recipe use, look for softer avocados. If needing sliced avocados, or if not using immediately, select firmer pieces of fruit. Avocados will continue to ripen after being picked. To ripen, place in paper bag and let stand at room temperature until desired softness. Ripe avocados can be stored in the refrigerator for several days. The flesh of a cut avocado will turn brown quickly, so cut just before using for best results. Or, brush the cut sides with lemon juice to help minimize the browning.